Daily Illuminator: Free Spooky Loot On Friday The 13th! April 13, 2018: Free Spooky Loot On Friday The 13th! Spring has sprung, and everything is bright and cheery . . . but that changes today! The doorsteps are darkened by the infamous Friday the 13th! Superstitions are high, and in our case, the dead seem to be poking their heads out of the ground. But fear not, we've turned this into an opportunity to give you free stuff! Today through Sunday, April 13-15, Warehouse 23 orders of $50 or more (for physical domestic orders only) will get a free Zombie Chibithulhu! 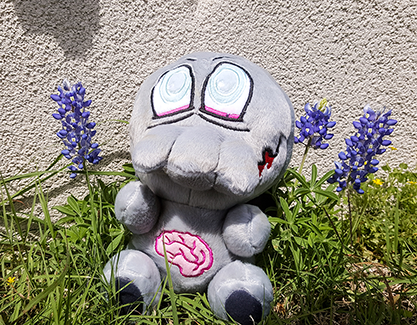 This plush little brain-eater will be a great companion when the rising tide of undead inevitably find you. And don't forget, our Spring Special is also on now, so by spending $50, you'll also get multiple free games plus double promos included with your order! Only somebody with no brains would give away this much stuff. It's like Warehouse 23 is run by actual zombies or something . . . If you're following us on Twitter or Facebook, keep an eye out for some undead giveaways happening today as well. A few lucky souls will win free horror-themed loot, so make sure you follow us on those channels. Don't be superstitious; get this free swag today!